The European Space Agency's (ESA) ExoMars program (Exobiology on Mars) is a series of missions designed to understand if life ever existed on Mars. Just as other countries often participate in NASA Mars missions, NASA contributes scientific, engineering, and technical expertise to other world efforts to explore the Red Planet. The second mission in the ExoMars program is the 2020 ExoMars Rover and landing platform, a partnership between ESA and Russia's Federal Space Agency, Roscosmos. It is scheduled to launch in the spring of 2020 and land on Mars nine months later. 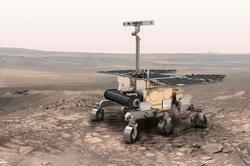 NASA's participation in the 2020 ExoMars Rover mission includes providing critical elements to the premier astrobiology instrument on the rover, the Mars Organic Molecule Analyzer (MOMA). By studying organic molecules, the chemical building blocks of life, MOMA is designed to help answer questions about whether life ever existed on Mars, along with its potential origin, evolution, and distribution on the Red Planet.